Imagine coming home from a long workday to a hungry family and having a pantry of ready-made meals waiting for you, meals that require just water and limited time. Dinner has never been so easy; this book gives a new lease on life! This became a reality for me when I found the book, Dinner Is In the Jar. I was speaking at a weekend conference in Idaho and decided to attend a couple classes between those I was teaching. The classes I heard were on how to stretch your time and your food budget by using a technique called meals in a jar. 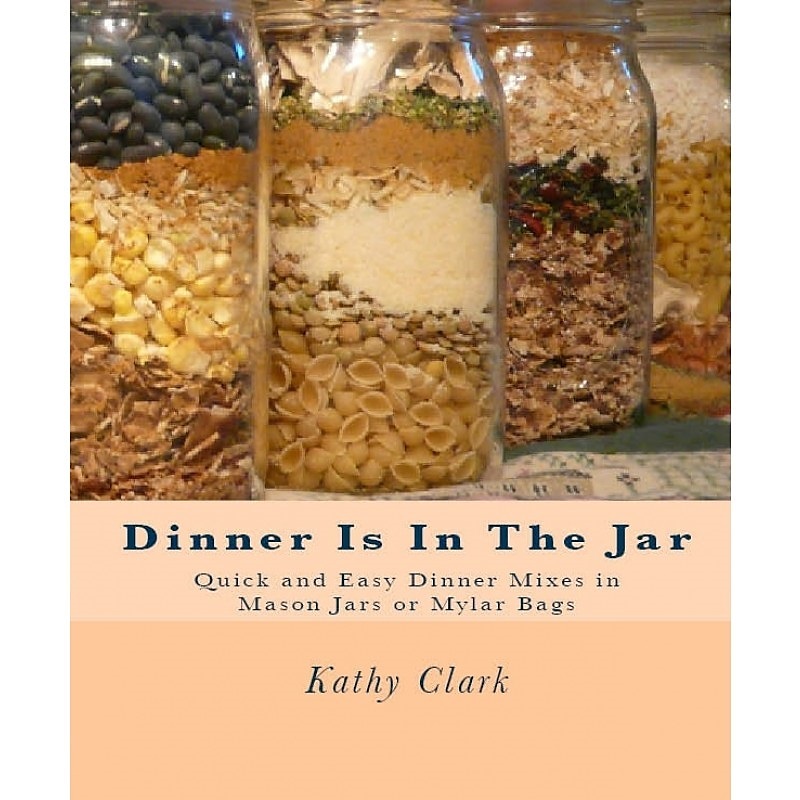 The teacher (Kathy Clark, author of the above-mentioned book) taught us how to make our own meals in jars and then gave us samples of some of these meals. Wow, this was good food! And not only were we given some delicious food, we were given the promise that their approach and cookbook would take the stress and guesswork out of cooking. Well, guess who bought that book! And I’m talking about it because her meal management technique and cookbook has lived up to her promise for a couple years now. I come into the kitchen after a long day of work, too tired to really think about dinner, and all I have to do it pull it off the shelf. Mix with water, cook, and serve. This 70 page book offers 30 quick-and-easy, all-in-one meals—a month’s worth. 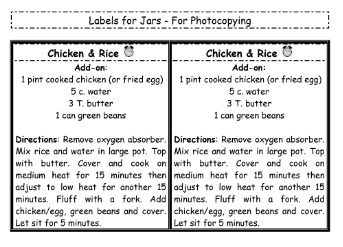 The recipes are meant to be copied and attached to each jar. And we’ve found all of them to be really good and easy to prep thanks to the step-by-step instructions provided. So easy in fact, that I’ve had grandkids get dinner on. What we’ve consistently found is that just because food is easy-to-store and long-lasting doesn't mean it can't be delicious and nutritious. 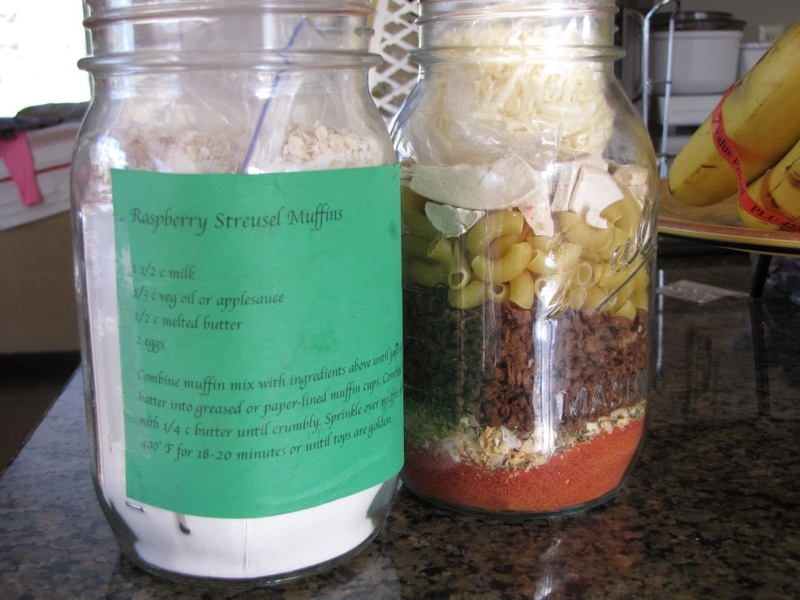 And another bonus: Not only are the Dinner Is In the Jar recipes perfect for everyday events (like camping trips, after-school study sessions, and rushed evenings), they’ve also been lifesavers in times of disasters (such as fires, blackouts, or hurricanes). 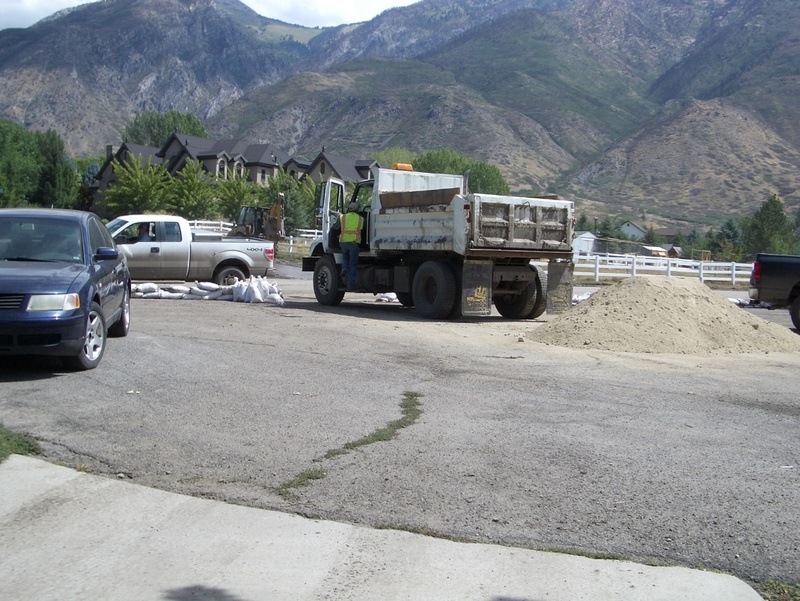 For example, a couple years ago we had a major mudslide in our community that disrupted life for a couple weeks. 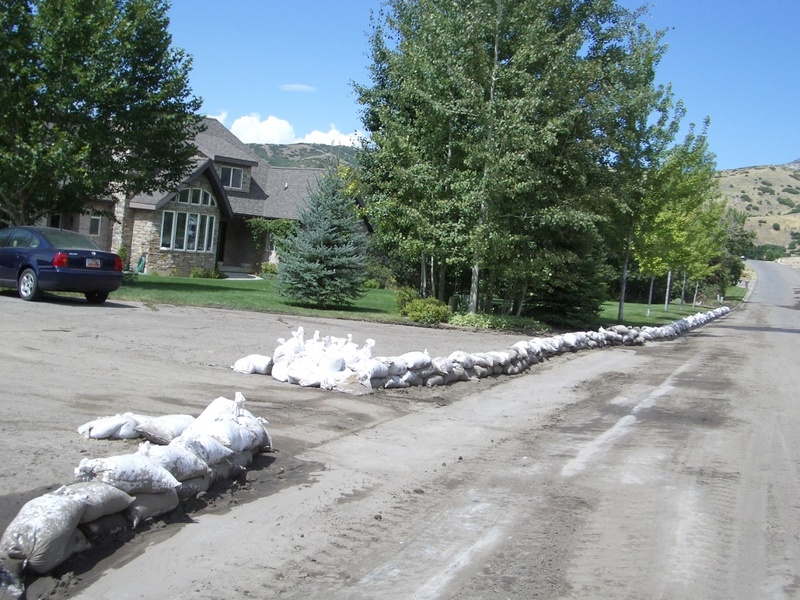 Because more heavy rain was threatening, we were all involved in filling and placing sandbags up and down all the threatened streets. And then there was the shoveling and removing of the mud that had already flowed. You can imagine the fatigue and exhaustion at the end of these long days. 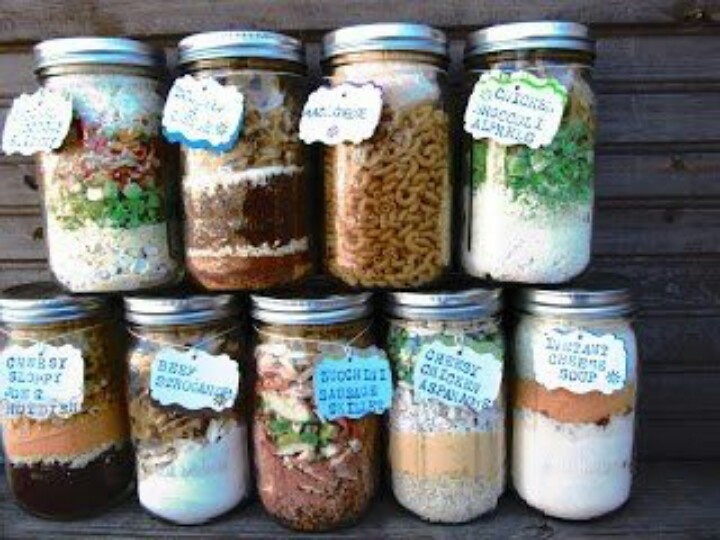 Thank goodness for my meals in a jar. In no time (and with next to no demand on my spent energy) I had dinner on. I passed these jars out to many of my neighbors as well. This probably sounds like an infomercial. But it’s not. I have nothing to gain by promoting Dinner Is In the Jar. I’m just passing on good news. Right now you’ll find this great book on amazon.com for about $12 new and around $9 used (I’m a big used book fan). With harvest season here, school starting, and holidays looming (where’s the year gone? ), this meal management technique and book might just be a new lease on life for you, too!